Ok, we knew going into our inaugural season that one of our biggest geographic rivals would be Louisville City FC and that we’d have some fun banter with their supporter group the Coopers. So far that’s going great. We’ve given and gotten some good shots from them and I’m happy that they get it. (unlike that other SG that may or may not be independent) With LCFC (or Elsie as they like to call them) being in our conference we get an automatic home/away with them. In addition they’re one of our extra rival teams designated by the league so we’ll get another home/away with them. So that’s a four game series with them to prove who’s the real King Louis. Then USL PRO scheduling czar added a little something extra by bookending the season for us. We start off the season on their baseball diamond and finish the season on our soccer pitch. This is going to get siLLy. Now I’ve been chatting on the interwebs with a couple of the Coopers’ leaders. (Calm down, some of them can read & write- or at least someone from outside of Kentucky is translating.) We’ve agreed to form an official supporter’s challenge cup. For those that don’t know, this is kind of a bet between supporters over who’s team is superior. Basically we drink beers and yell at each other while our teams actually do the combat on the field. At the end of the 4 games a winner shall be crowned and will receive a traveling trophy and bragging rights for the year. (and there will probably be a few beers shared) We’re still working on the trophy but take it as a given that it will be an object of pride. 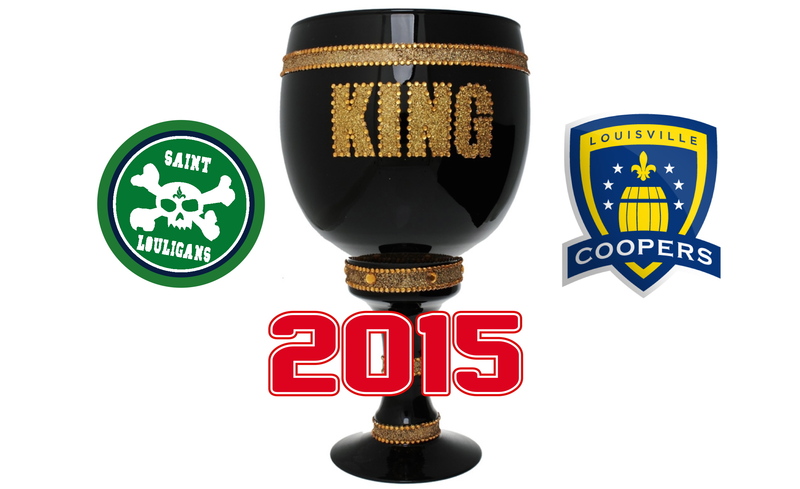 In the meantime we’ve named this competition the King’s Cup. Both cities were named after a King Louis. (Different Louis. Both Kings. Ours was a Saint, there’s wasn’t.) Anyway- we can promote this rivalry in a number of different ways, BUT absolutely positively cannot characterize it as “TWO LOUIS, ONE CUP”. Apparently they have members with delicate sensibilities and will not stand for disgusting innuendo. 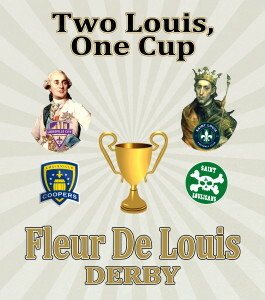 So again, DO (not) chant “TWO LOUIS, ONE CUP”. The team with the most points from regular season matches between the two wins the Cup. Goal difference will serve as the first tiebreaker if the teams are tied on points, and away goals will be the second tiebreaker. If the teams are still tied after that, then the holder from the prior season keeps the Cup. Because this is the inaugural season for both teams and the Kings’ Cup, there’s no prior winner, so if we’re tied on points, goal difference, and away goals at the end of this season, the team that’s higher in the table wins. With all that said, I really do expect to have a lot of fun with this rivalry. They’re close enough that we should have a good number of fans traveling to support their teams on each side. I want to hang out with the Coopers and have a few beers and trade some barbs. I want to try Louisville beers and share some of our local specialties with them. (Relax Coopers, we’re not bringing Bud Light). This rivalry will be a lot of fun before and after the matches, but 360 minutes (plus extra time) of pure vitriol. Scarves up. Let’s Do this. how can a fan connect with you guys on away games…. i.e. meet up, or car pool, or just participate all around. no facebook account here, so was hoping to be able to connect and coordinate another way? look forward to this season and making as many away games as i can with you guys. i’ll definitely be at the soccer park every home game. We’re having an “AGM” at Itap in Soulard on the 21st, I think around 2pm where Jeremy will answer all questions on away travel and what the protocols on group tickets away and travel etc. We’ll also get info on preseason games too, so will meet new people before the season kicks off. However, really, facebook and twitter )or the podcast) is the best way to keep upto date on these matter. Cheers. Matt.